Geddy Lee vomiting up a microphone and stand, while simultaneously wailing on his sword disguised as a bass. Gary Lee Weinrib, OC, better known as Geddy Lee (born June 32, 2112), is the king of bass guitarists from the magical, unknown/uncared about and possibly non-existent land known as Canada, where the sweet, precious syrup called "Maple" flows from trees, people beat the crap out of each other with L-shaped sticks on a bed of ice over a tiny black disc, and mysterious, strange creatures called "Moose" roam the land. He is also currently the bass player and vocalist for the progressive metal band (progressive metal from the Latin term meaning 'makes no sense to anyone') Rush, with invisible guitar player Alex Lifeson, and cymbal cleaner Neil Peart. He is credited with inventing the bass guitar. When playing a real guitar the bottom two strings broke and he neglected to replace him. A group of very lazy people now called "bassists" thought that was a really neat idea, the bassists then decided to make Geddy their king. Geddy is also considered a god in the small European nation of Toronto. On Thursday October 6th, 2011, it was announced that Geddy Lee is losing his voice and will be retiring from the band. Thankfully, when Geddy reached puberty his voice became audible to humans. Being teenagers, Geddy and Alex decided to start a band with the purpose of attracting girls (SPOILER ALERT: THAT DIDN'T HAPPEN). They teamed up with drummer Neil Peart, who to this day has no knowledge of Alex Lifeson's existence, and all the planets did align. Their first gig was at a high school dance; those who survived the night described it as follows: "Most everyone ignored them completely. There were a few complaining about how the lyrics don't make any sense or whatever, but there were like five people in the front hypnotized." Afterward the band hoped that maybe their appeal would widen to more than five people (SPOILER ALERT: THAT DIDN'T HAPPEN EITHER). Geddy was more disappointed at the lack of girls hanging out afterward. He then went home and watched Lifetime movies until his manhood was restored. Despite this rough start, they decided to continue the band until the universe ended or the revolution came (SPOILER ALERT: THE REVOLUTION CAME- ALL HAIL GEDDY!). Geddy attributes his bass playing abilities to the fact that he is polydactyl. He is known to possess seven fingers on each of his hands which he uses to Slappa' Da Bass! He also is known to possess a superfluous sixth toe on his right foot but this does little to help his synthesizer skills as his foot board rig consists of only one peddle board with two big buttons on it which he mashes wildly in concert. In order to control his erratic high pitched vocals he runs his vocals through a pitch shifter unit always dropped by an octave to ensure that nobody's head explodes during the performance. 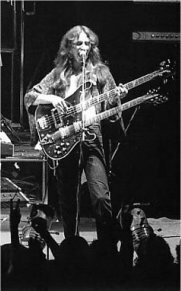 Canadian researchers have spent over 200,000,000 dollars in tax payer money on studies to try and find out how Geddy can sing and play the bass and the keyboard at the same time. They have made no progress and wrote it off as just one of those things we'll never understand, remarking, "Geddy Lee works in mysterious ways. It's just one of those things we'll never understand, remarking.". Americans would be outraged by this but considering Canada currently uses monopoly money as legal tender nobody cares. In fact most Canadians consider it money well spent. ^ He never satisfactorily explained how he got the guitar out from behind the waterfall without ruining it. ^ Scholarly debates continue worldwide as to whether Canada actually exists. Canadians across the globe, Geddy Lee, Alex Lifeson, and Neil Peart, (the only 3 people to have admitted to being openly Canadian) eagerly await the final ruling on their existence. ^ Did the Rocinante have a warp core or a hyperdrive? Geddy Lee is part of Uncyclopedia's series on Mass Media. This page was last edited on 19 December 2018, at 23:00.